However, the bigmonster and I are dining out tomorrow night -I’ve taken advantage of a special Eurostar promotion to score a table for us at the normally members-only 30|40 restaurant at the top of one of London’s landmark buildings – the Gherkin. I hope Searcy’s 30|40 restaurant will stack up to its amazing location. Check back in on Friday when I hope to be able to tell you all about it. The manager’s granted us permission to take photos too and I can’t wait to see the inside of one of my favourite buildings in London. If I’m going to satisfy my sweet tooth craving before then, I need a pudding that’s not going to undo all the effort we’ve made these last couple of days. 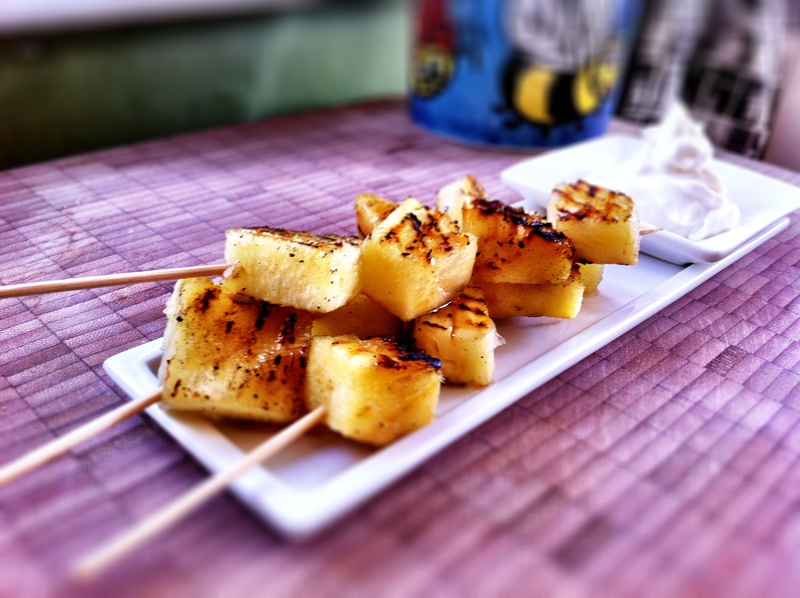 I’m not very good at making desserts so these grilled and honey-glazed pineapple skewers are the perfect, simple midweek pick-me-up. We’d bought a pack of fresh pineapple chunks that turned out to be far more sour than sweet but I read somewhere that grilling or baking citrus fruits like lemons helps to bring out the natural sugars in the fruit. So, hey presto, out comes the griddle pan and into that goes our sour pineapples. After searing the pineapples thoroughly, I’ve skewered them into fruit kebabs and drizzled some runny honey over the top. 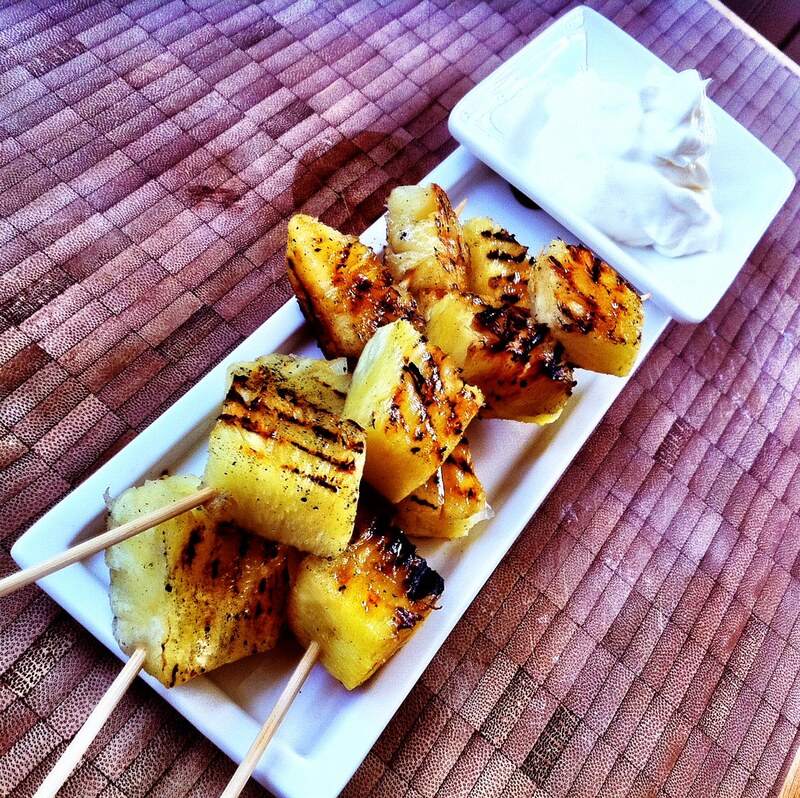 Some unsweetened greek yoghurt served as a perfect dip for the grilled pineapple chunks and all in all, this simple dessert did the trick! ← Nothing beats home-grown. Anyone have any apple-based recipe ideas to share? Looks yummy. I love pineapple. I got obsessed with a barbecue place in thailand a few years ago because they barbequed pineapple. Really amazing photos. They look really amazing and striking. I love them already.